Gift of Elsie Sadilek; Property of Friends of Library; Oswego Women's Club in 1930's. Mrs. Eliz. Pettinger seated behind Rob Sadilek. [stamp]: Panel-Art Snapshots, Oct. 21, 1935, B 4. Description Slight creases. Accompanying card: Oswego Women's Club. 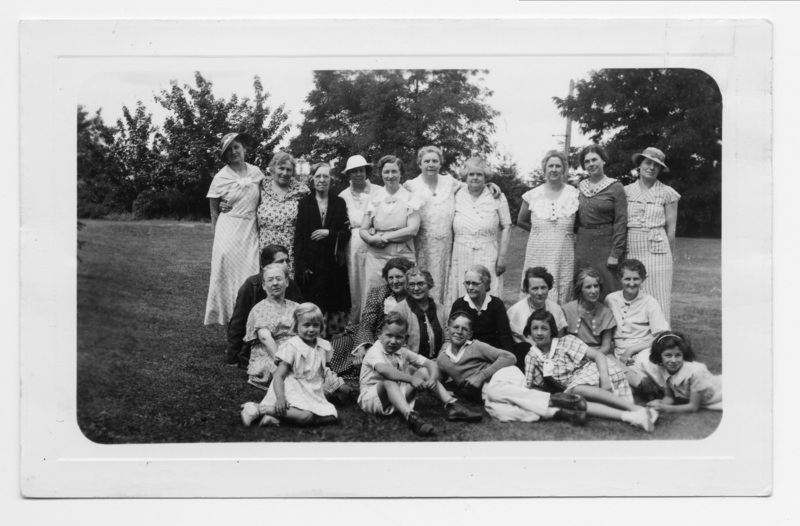 back row: Elsie Sadilek, Cora Bullock, Mrs. Nelson, Belle Robertson, Gladys Centers, Millie Sadilek, Zobedia Schawper, Vera Poulson, Leona Davidson, Myrtle King. second row, seated: Irene Beutler, Mrs. Eugene Worthington. Third row, seated: Mrs. Newman, Elizabeth Pettinger, Mrs. Duval Jackson, Elsie Duis, Ida Worthington, Minnie Clinefelter. Front row: Willa Worthington, Robert Sadilek, Owen Centers, Doris Poulson, Joyce King. _in '30s. Transcription Gift of Elsie Sadilek; Property of Friends of Library; Oswego Women's Club in 1930's. Mrs. Eliz. Pettinger seated behind Rob Sadilek. [stamp]: Panel-Art Snapshots, Oct. 21, 1935, B 4. Physical Description H 3" x L 4 3/4"